Make sure Steam is running, and open your game library. Find 'Just Death' and click the 'Play' button. This process is identical to every other Steam game, so if you're having an issue at this point please consult the Steam Support documentation. Once you start the game, you'll see a loading screen then you'll be presented with the main menu. 'Offline' is a mode where you can practice your skills before playing against other players in a multiplayer/online setting. 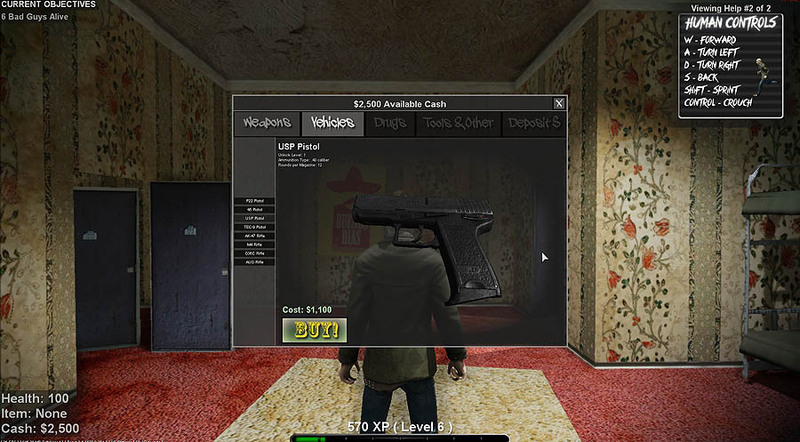 'Online' is the primary mode of play. 'Options' allows you to adjust various settings and configuration parameters ( see 'Options' section below for more detailed description of available settings ). 'Credits' views a list of the people who created the game. 'Exit' closes the program and returns you to your desktop. You can use your mouse to select an option and LEFT CLICK, or if you have a controller connected, you can use your DIRECTIONAL PAD to adjust the currently selected option ( make sure the mouse cursor isn't over an option! ). See below for an image of how the main menu should look. If you've selected the 'Offline' option at the main menu, you'll be thrown right into the game, if that is the case, please skip this section. If you've selected 'Online' at the main menu, you'll be presented with the 'Server Finder'. 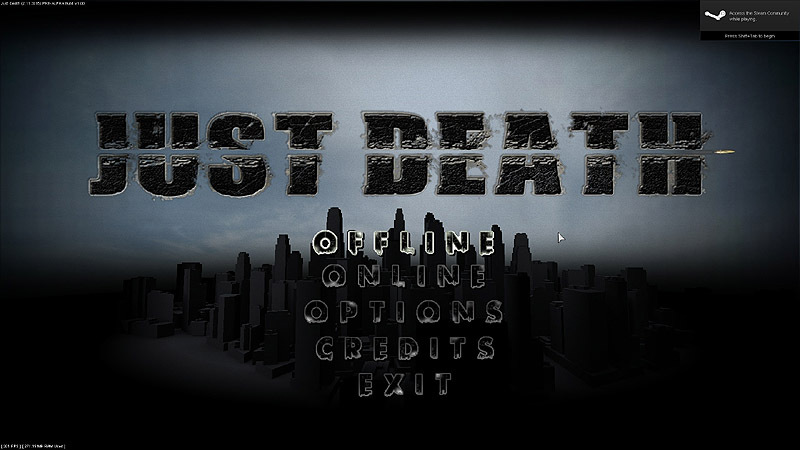 There are official game servers, and user-run game servers for 'Just Death' available. 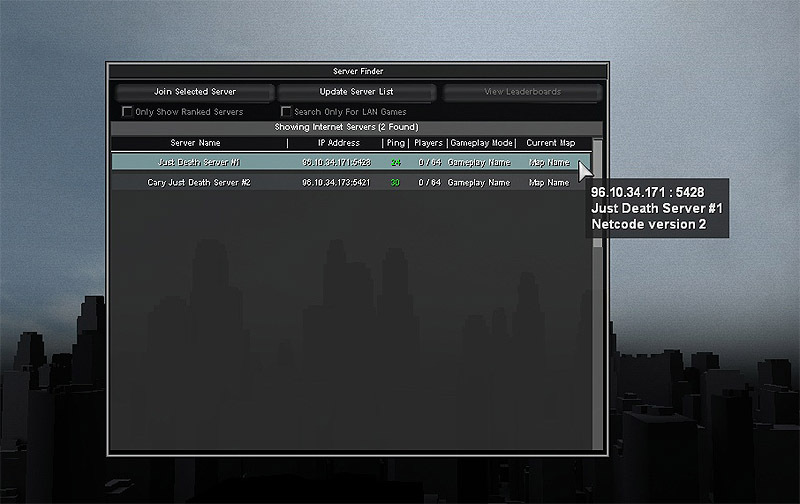 The 'Server Finder' allows you to decide which game server you'd like to play on. If no servers show up on this screen, please press the 'Update Server List' button, this will download a new list of all current game servers from the 'Master Server'. You need to use your mouse to select a game server, then LEFT CLICK to highlight it. Once highlighted, press the 'Join Selected Server' button to attempt a connection with the server. You can also view ONLY game servers running on your local network ( LAN ) by checking the 'Search Only For LAN Games' check box. When determining which server to join, please note the 'Ping' is the number of milliseconds it takes for data to reach the server from your computer. The lower the 'ping' time, the better the game experience will be for you. Note in order to connect to a game server it must be running the game 'Netcode version' as your game client. See below for an image of how the server finder should look. 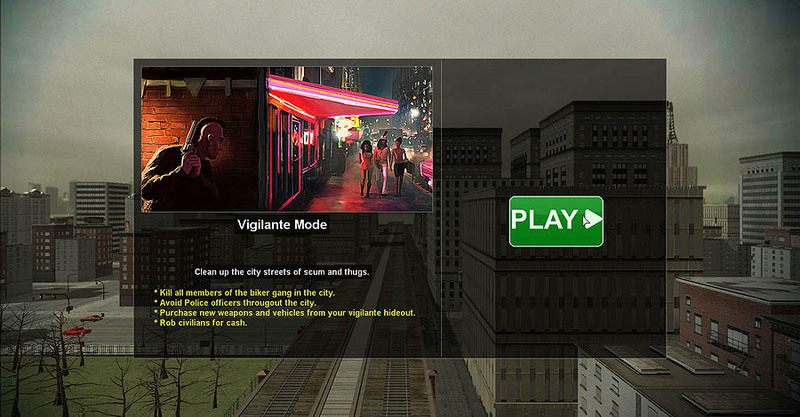 If at any time you un-control your vigilante, you can re-take control of your Vigilante character by either DOUBLE CLICKING on the character using the left mouse button, or by using the 'Click To Control Your Vigilante' button at the bottom of the user-interface. By clicking the 'Click To Control Your Vigilante' button, you'll automatically be given control of your Vigilante character, no matter where your camera/view is in the game world. All controls in-game are re-definable though the options menu. By default movement uses "W,A,S,D" keys. Mouse looks around, Left-mouse-button uses/shoots current item, Right-mouse-button aims/zoms. "C" key changes camera. "E" key interacts with the world. Gameplay Objectives & Victory Conditions can be viewed here. Link to server admin documentation here.